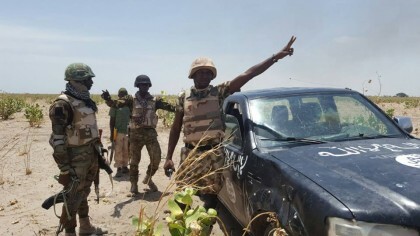 I am delighted at, and most proud of the gallant troops of the Nigerian Army, on receipt of the long-awaited and most gratifying news of the final crushing of Boko Haram terrorists in their last enclave in Sambisa Forest. I want to use this opportunity to commend the determination, courage and resilience of troops of Operation Lafiya Dole at finally entering and crushing the remnants of the Boko Haram insurgents at “Camp Zero”, which is located deep within the heart of Sambisa Forest. I was told by the Chief of Army Staff that the Camp fell at about 1:35pm on Friday, December 22, and that the terrorists are on the run, and no longer have a place to hide. I urge you to maintain the tempo by pursuing them and bringing them to justice. I, therefore, call on all Nigerians to cooperate and support the Nigerian Armed Forces and other security agencies by providing useful information that will expose all the terrorists hiding among the populace. Further efforts should be intensified to locate and free our remaining Chibok girls still in captivity. May God be with them. I also want to congratulate and commend the able leadership of the Nigerian Army in particular and indeed, that of the Armed Forces in general, for making this possible. This, no doubt, will go a long way in improving the security situation not only in the North East, but the country in general. But we must not let our guards down. Once more, congratulations to our troops and all who, in one way or the other, contributed to this most commendable and momentous effort. May the Almighty continue to be with you. I wish you a Merry Christmas and a most rewarding and peaceful Year 2017 ahead.